Perhaps you installed the perfectly sized birdhouse for your backyard birds, specifically to keep them safe from larger creatures while they lay eggs and raise chicks. But a hungry predator had different plans. Predatory birds and squirrels sometimes widen the hole of little birdhouses to get at the young inside. 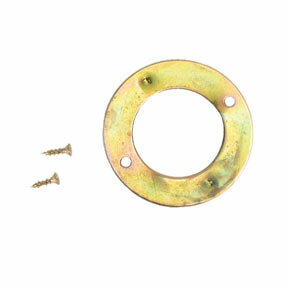 Reinforce a chewed-up birdhouse with a Portal Protector. Or avoid the heartache altogether by starting off a new home with one. It's easy and quick to install on a wooden birdhouse, simply screw it on around the opening. Our Portal Protectors come in two sizes. The Bluebird Portal Protector has a 1½" wide opening, which fits around the hole of a typical bluebird house. 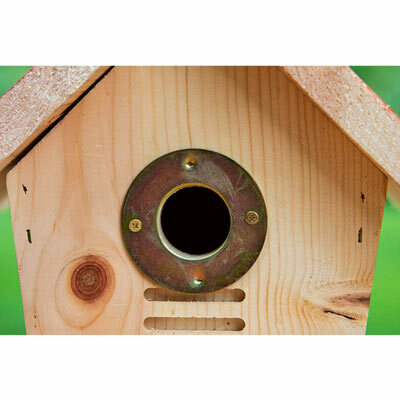 The Smaller Birds Portal Protector has a 1¼" wide opening, which fits around the entrance of a house for little birds like chickadees or titmice.